Jan Miense Molenaer (1609/1610–1668), Smell (1637), oil on panel, dimensions and location not known. Wikimedia Commons. We can associate visual images with predominantly non-visual experiences. One of my most memorable associations of this kind occurs in Antonioni’s 1966 movie Blow-Up, in which I hear the soft roar of wind when David Hemmings’ character is studying his enlarged monochrome photographs. When someone regularly experiences crossed sensations like this, it is known as synaesthesia – in which a musical chord might evoke a specific colour, for example. Painting non-visual experiences may seem like attempting the impossible, but many great artists have either been commissioned or felt compelled to do so. There are many well-known themes which are primarily non-visual; this article looks and sniffs at one of the toughest – smell. Jan Brueghel the Elder (1568–1625) and Peter Paul Rubens (1577–1640), Allegory of the Sense of Smell (c 1617-18), oil on panel, 65 × 111 cm, Museo Nacional del Prado, Madrid. Wikimedia Commons. The best-known and still-startling example of the classical approach to painting smell is Jan Brueghel the Elder and Peter Paul Rubens’ magnificent Allegory of the Sense of Smell (c 1617-18). 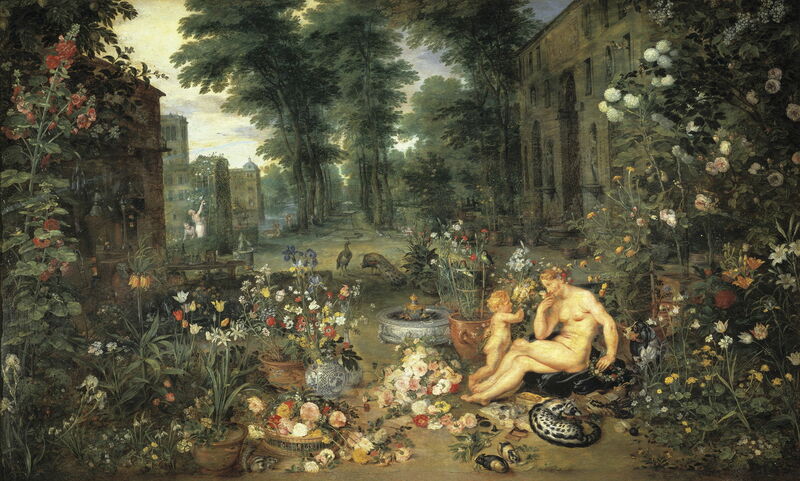 Although Rubens’ figures are a delight, it is Brueghel’s wealth of detail which makes this, and the whole series of five allegories of the senses, so compelling. This set the benchmark for the symbolic objects which could be included to allude to the sense of smell: flowers, of course, with at least a couple of dozen different fragrant species shown, vanilla pods in the foreground being eaten by guinea pigs, a squirrel, the ill-scented civet with its distinctive black and white markings, and a hound (presumably an antecedent of the bloodhound) for its famed sense of smell. Brueghel also includes vials of scent, and the apparatus for distilling essential oils and perfumes in the left middle distance. Jan Brueghel the Elder (1568–1625), Hendrick van Balen the Elder (1573–1632), and Gerard Seghers (1591–1651), Allegory of Sight and Smell (c 1617-18), oil on panel, 175 x 263 cm, Museo Nacional del Prado, Madrid. Wikimedia Commons. At the same time that he was working with Rubens on that series, Brueghel was busy with Hendrick van Balen the Elder and Gerard Seghers on two paintings for presentation to Albert VII and Isabella, governors of the Spanish Netherlands. 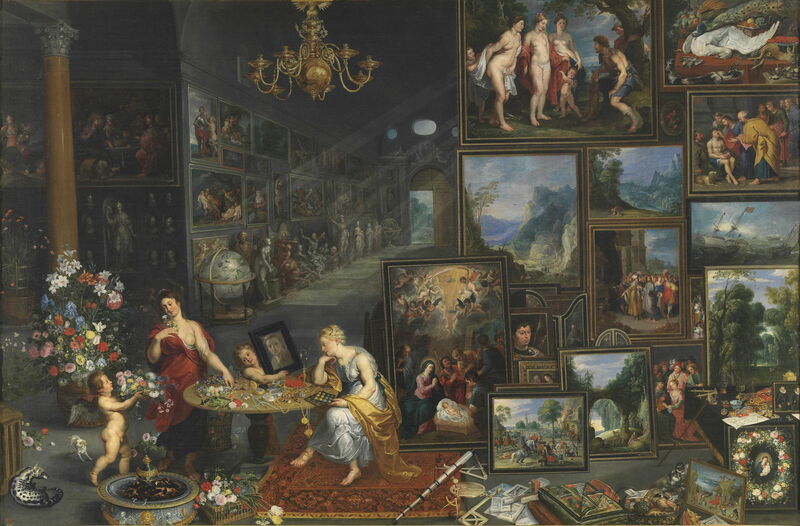 These show combinations of senses, here Allegory of Sight and Smell (c 1617-18). This works as a précis of the full series, with the lower left devoted to smell, where there is an abundance of flowers, and a civet. José de Ribera (1591–1652), Allegory of Smell (1615-16), oil on canvas, 115 x 88 cm, Private collection. Wikimedia Commons. Brueghel was not the first, and José de Ribera’s slightly earlier series of five paintings on the senses are too readily forgotten. 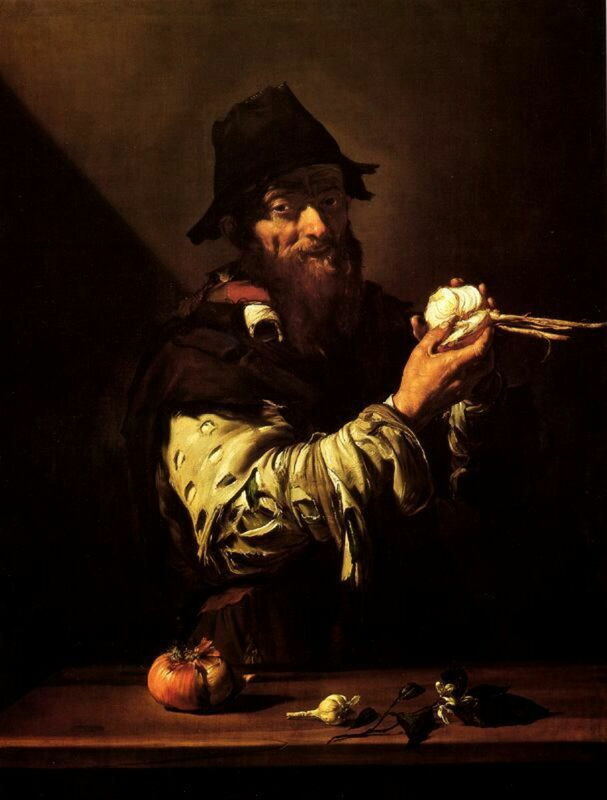 Allegory of Smell (1615-16) is much simpler, focussing on the more commonplace and less pictorial onion and garlic, and perhaps the equally pungent odour of the rough and tattered man flourishing the cut onion. Rembrandt Harmenszoon van Rijn (1606–1669), The Unconscious Patient (Allegory of Smell) (c 1624), oil on panel, 31.7 x 25.4 cm, Private collection. Wikimedia Commons. 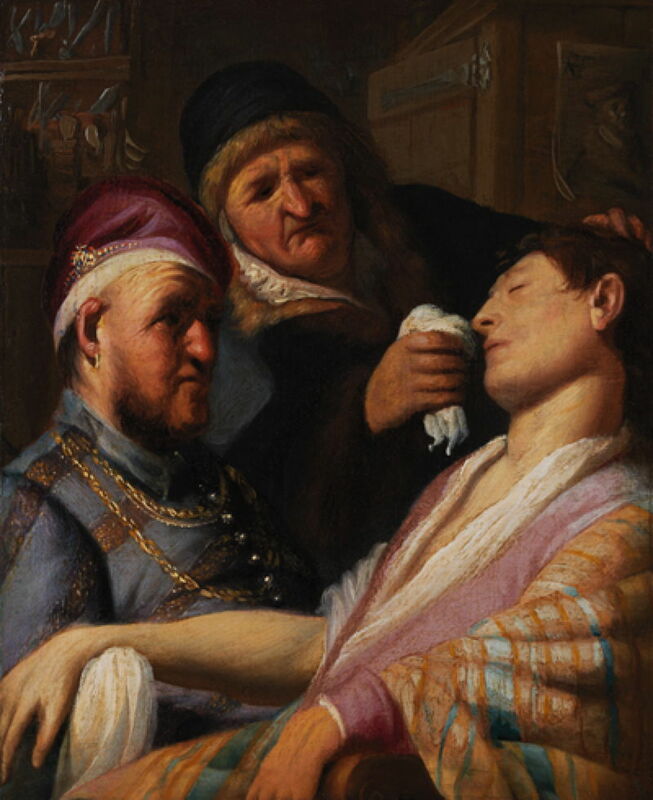 This painting of The Unconscious Patient (Allegory of Smell) from about 1624 is believed to be Rembrandt’s earliest signed work, completed when he was only eighteen. It shows a barber-surgeon’s assistant trying to revive a patient from unconsciousness using smelling salts – a particularly pungent aroma. Three of the other paintings in this series were well-known, but two had apparently gone missing. This was re-discovered in 2015, but that of taste remains lost. Pietro Paolini (1603-1681) (attr) Allegory of the Five Senses (c 1630), oil on canvas, 125.1 x 173 cm, The Walters Art Museum, Baltimore, MD. Courtesy of The Walters Art Museum. Several painters incorporated all five senses into a single allegorical image. 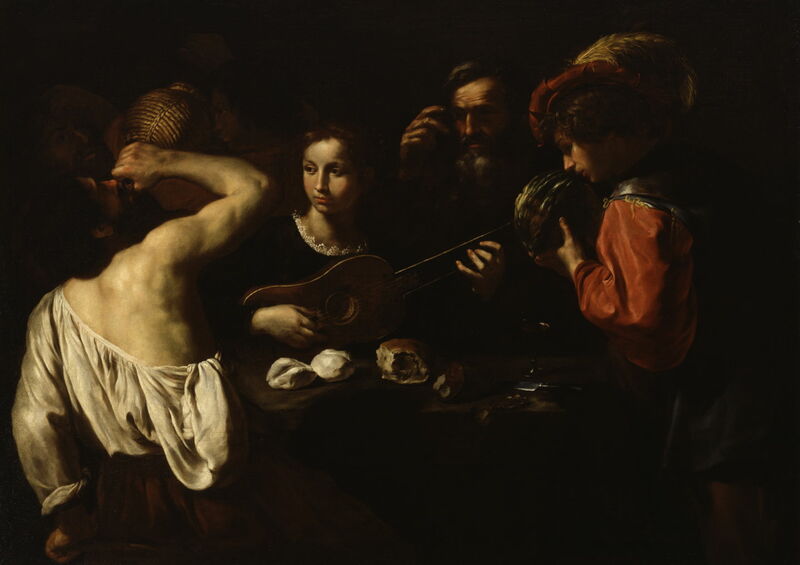 Allegory of the Five Senses (c 1630), attributed to Pietro Paolini, is among the more successful. The figure on the right is sniffing a large melon, which is perhaps more nuanced than the more popular use of scented flowers. 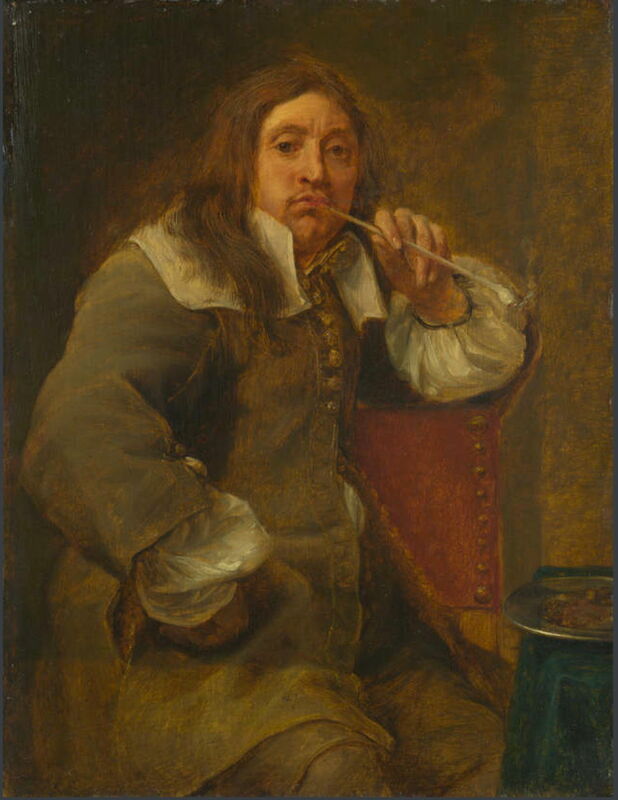 Jan Miense Molenaer introduced a touch of humour in his Smell (1637), in which neither of the competing smells of the smoker or the baby’s bum are attractive, but both are only too familiar. He is also an early user of gesture to make the subject clear. 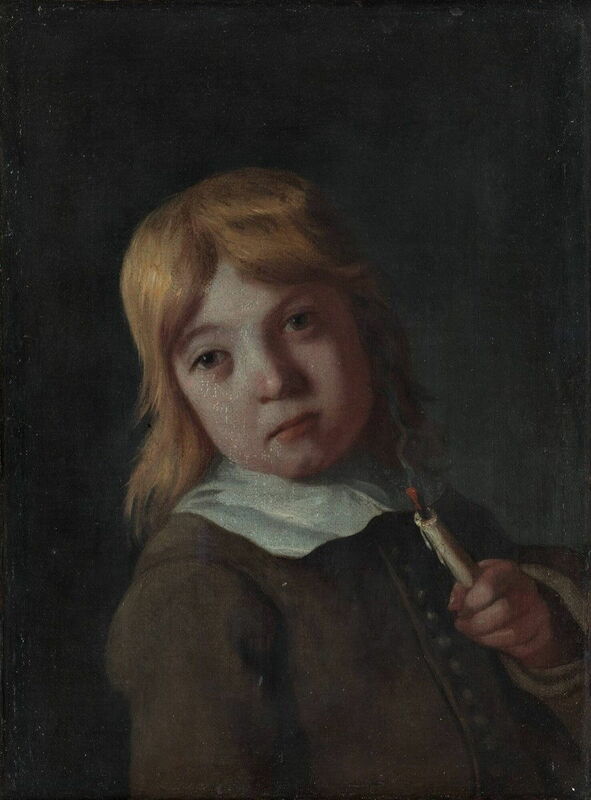 Michiel Sweerts (1618–1664), A Boy with an Extinguished Candle (Smell) (1656-61), oil on canvas, 24.5 x 18.1 cm, Museum Boijmans Van Beuningen, Rotterdam, The Netherlands. Wikimedia Commons. By the middle of the seventeenth century, northern European painters, particularly those in what are now The Netherlands and Belgium, had made ‘sensory portraits’ quite popular. This is Michiel Sweerts’ A Boy with an Extinguished Candle (Smell) (1656-61), invoking another quite pungent everyday smell. Gonzales Coques (1618–1684), Smell (Portrait of Lucas Faydherbe) (before 1661), oil on oak, 25.3 × 19.3 cm, The National Gallery, London. Wikimedia Commons. Gonzales Coques seems to have painted several sets of sensory portraits. That above is the National Gallery’s Smell (Portrait of Lucas Faydherbe) (before 1661), and that below, of Smell (before 1661), is currently in Sibiu, in Romania. They both refer to the consumption of tobacco: that above to pipe smoking, and that below to the taking of snuff. 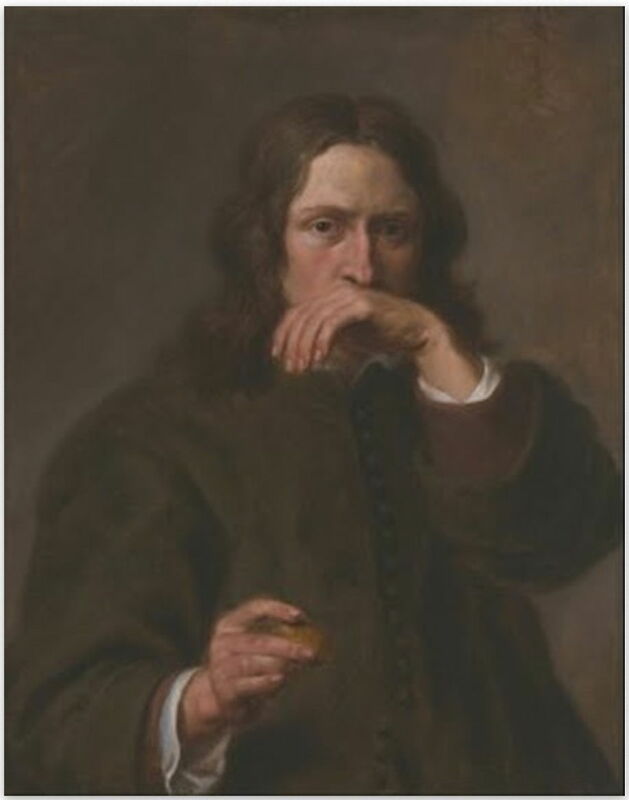 Gonzales Coques (1618–1684), Smell (before 1661), oil, dimensions not known, Muzeul Naţional Brukenthal, Sibiu, Romania. Wikimedia Commons. Towards the end of this fashion for sensory allegories, some became quite convoluted. 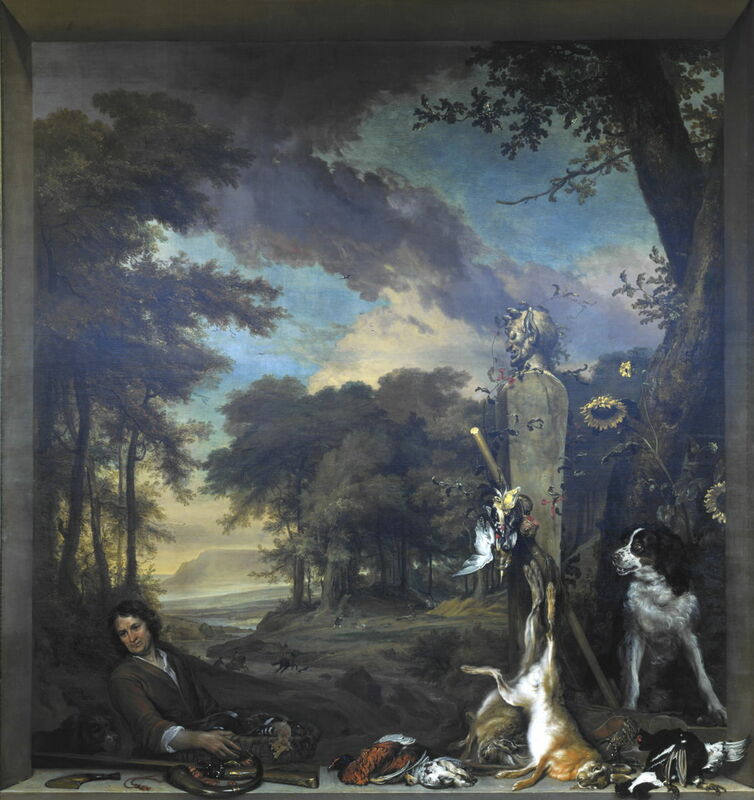 Jan Weenix’s Landscape with a Huntsmen and Dead Game (Allegory of the Sense of Smell) (1697) is at once a painting of a framed painting, a landscape, and an allegory, with a bit of classical myth thrown in for good measure. Rather than repeat the now hackneyed objects which Brueghel had laid out, Weenix prompts us with a very few flowers, a couple of hunting dogs, and an extensive array of game which is presumably smelling rank as it is ‘hung’. Philip Mercier (c 1689-1760), The Sense of Smell (1744-47), oil on canvas, 132.1 x 153.7 cm, Yale Center for British Art, New Haven, CT. Wikimedia Commons. 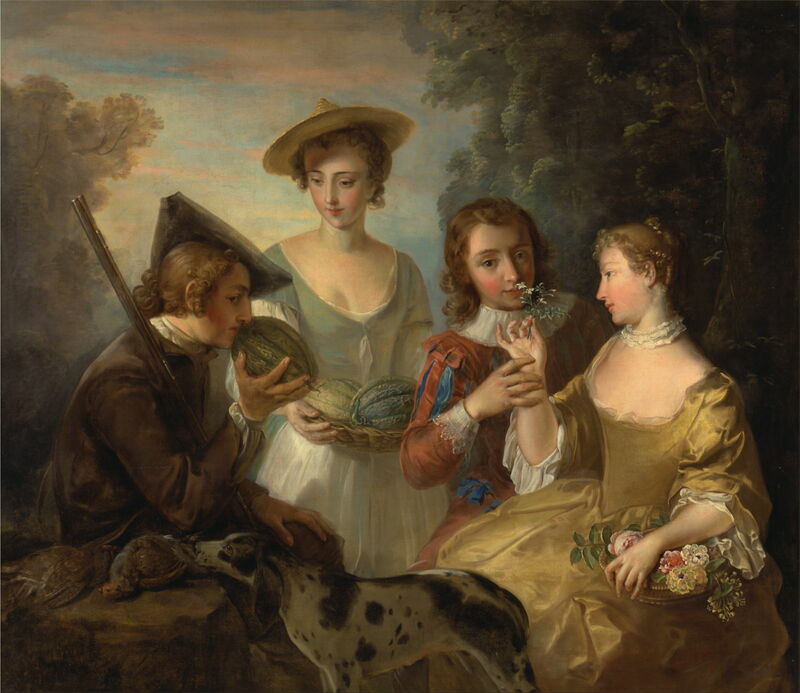 With allegories out of fashion by now, Philip Mercier still shows us an allegory in The Sense of Smell (1744-47). Two fashionable young couples are exploring the senses, sniffing melons and flowers. The pair of dead game birds has, I think, only just been shot, so should not be contributing to the olfactory experience, but the gun dog is another visual cue. So it was that in the latter half of the nineteenth century, the rise of the Aesthetic Movement and its influence on British painting brought more works which refer to smell. George Frederic Watts (1817–1904), Choosing, A Portrait of Ellen Terry (1864), oil on canvas, dimensions not known, The National Portrait Gallery, London. Wikimedia Commons. 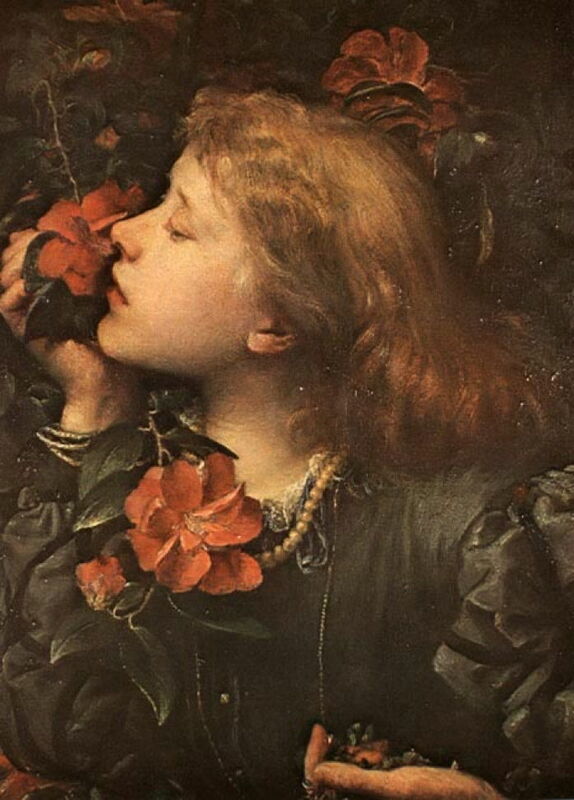 Flowers were frequent in Dante Gabriel Rossetti’s early aesthetic paintings, but their role was probably not to refer to the sense of smell. That was more significant in George Frederic Watts’ Choosing, A Portrait of Ellen Terry (1864). His new wife is shown making the choice between large, showy but unscented camellia flowers, and humbler but fragrant violets, symbolising the choice between the material and spiritual. Hans Makart (1840–1884), The Five Senses: Smell (date not known), oil, dimensions not known, Österreichische Galerie Belvedere, Vienna, Austria. Wikimedia Commons. Beautiful and largely undressed women also graced the Salons of the day, while sniffing flowers. Hans Makart’s The Five Senses: Smell, probably from around 1870, is unusual in that it is one of a series depicting the five senses. 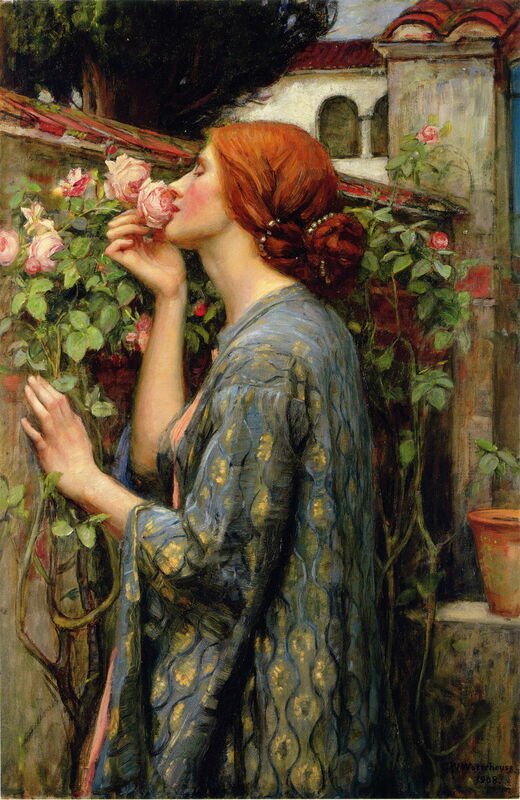 John William Waterhouse (1849–1917), The Soul of the Rose (1908), oil on canvas, 88.3 x 59.1 cm, Private collection. Wikimedia Commons. John William Waterhouse’s The Soul of the Rose (1908), above, returns to the Aesthetic track also followed by the overtly classical At the Garden Shrine, Pompeii (below) by John William Godward in about 1910. John William Godward (1861–1922), At the Garden Shrine, Pompeii (date not known), oil on canvas, dimensions not known, Private collection. Wikimedia Commons. These are all wonderful paintings, which succeed as allegories in which the images make clear reference to the sense of smell. But for me, none actually evokes any particular smell as such. Perhaps they – or another painting – work for you? Posted in General, Painting and tagged Aestheticism, allegory, Bruegel, Brueghel, Coques, Godward, Makart, Mercier, Molenaer, painting, Paolini, Rembrandt, Ribera, Rubens, smell, Sweerts, Waterhouse, Watts, Weenix. Bookmark the permalink. I can’t say that the pictures evoke any smell memories, but they are intriguing in the ways that they take up the idea. I think the woman with her face pressed into the flowers is most evocative for me — the diaper painting is pretty evocative too. Admittedly these artists chose a difficult challenge, but made some wonderful pictures.